God provided the original vision for a Christian library in November 1990 when Willard Black, Executive Director of the Institute for Christian Resources, began to prayerfully pursue the possibilities and means to provide much needed Christian resources in the former Soviet Bloc countries. 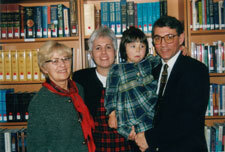 During an exploratory trip we made with Willard in the summer of 1994, involving the possibility to meet and talk with various Christian leaders as well as observing the spiritual landscape, God provided the clear confirmation of the need and desire for the establishment of a public Christian library. 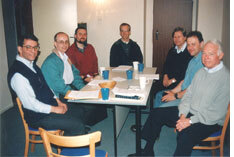 After time spent seeking out funding and support, we arrived back in Prague in March 1997. During the following months we began to make further contacts, look for a suitable location, and we also started the process of establishing the library as a legal non-profit organization. In the fall of 1997, inquiries about permission to use the current address for our legal paperwork eventually led to a potential site for the library. A ground floor space at Baranova 32 was being renovated, which met the size, location, and cost requirements. Renovations were completed in record time and the lease for our current facility was signed in early 1998. The legal process which was quite involved and required the completion of many steps even before the papers could be filed. One of the first requirements was the careful selection of the Board of Directors and Supervisory Board -- as with every aspect of library development something for which we are very grateful to God for His leading. Our founding document was drafted and filed in late September 1998 and government approval came five months later in February 1999. The library was incorporated in early April, and the first Board meeting was held on April 26,1999 with all members of both boards present. The next six months were an extremely busy time including cataloging and processing books, selecting furnishings and shelving for the facilities, adopting policies and procedures to guide the daily functioning of the library, and preparing for the library opening. With over 90 people present, Prague Christian Library was dedicated on November 20, 1999 which interestingly enough by God’s clear leading coincided precisely with the 10th anniversary of the Velvet Revolution -- the event that brought down the fall of communism in the Czech Republic. During the day of dedication, Lumír Ptacek, Chairman of the Board of Directors, reflected on how God's purposes can be realized sometimes only over time. He observed that in the wave of post-communist exuberance, a flood of ideas and plans ensued and while some have unfortunately faded, by God’s grace and provision, the concept of a Christian library, available and open to the general public endured to the point of reality. Pavel Raus founder and past director of Navrat domu, one of the largest evangelical publishing houses in the Czech Republic, who has served on the board since the founding, confirmed that books can indeed be a very powerful and culturally relevant tool that God can use to touch and transform hearts. Comments including words of blessing for the library ministry were also made by Willard Black. Our colleague David Snell, who has worked to develop and provide leadership training opportunities for local pastors here in the Czech Republic, gave the prayer of dedication.